In this section we look at using JavaServer Pages (JSPs) and will be covering the 2.1 release. You need to have an understanding of Java and Servlets to get the most from these lessons, so if you're completely new to Java I suggest going to the Java5 section of the site and doing the lessons there first. If you're new to Servlets you would be better doing the lessons in the Sevlets 2.5 section of the site first. The following link will take you to the download page for the final release specification for the JSP 2.1 release which you can download and read at your leisure, JSR-245 specification. We saw in the Servlets 2.5 section of the site how arduous it was to write even the simplest web page using Servlets. with JSPs we do not have to enclose all our HTML tags within Java Strings. Any changes made to hardcoded HTML tags or text within a Servlet require recompilation and redeployment, with JSPs we do not have to compile, recompile or redeploy our source code. JSPs can be invoked directly from a browser without any need to set up entries in the Deployment Descriptor (DD) which we have to do when using Servlets. All this sounds great but JSPs are not a replacement for Servlets, in fact 'under the hood' JSPs are translated into Servlets by the container, the details of which we will go into in the JSP Lifecycle lesson. Think of the two technologies as accompaniments to each other, where we use JSPs for our View and Java and Servlets for the Model and Controller; in fact all modern web applications that use the technologies will have a mixture of each. We will investigate the interfaces and classes within the javax.servlet.jsp package as we work through the rest of this section. We will look at some of the interfaces and classes within the javax.el package within the Expression Language 2.1 section. We will inspect interfaces and classes in the javax.servlet.jsp.tagext package in the JavaServer Pages Standard Tag Libraries 1.2 section. To see how easy it is to write a JSP instead of a servlet we will write a very simple JSP that just outputs a message. The first thing we are going to do in our setup is to make a base folder called _JSP in the root directory of our hard drive which we can put all web applications for this section into. click the Folder option and call the folder _JSP and press enter. Within the firstjsp folder we will create separate folders to hold our DD and JSPs. Our first very simple JSP is coded below and looks just like a HTML page. Ok, with Notepad or a similar text editor cut and paste the above HTML. In the Save in: tab at the top make sure you are pointing to the C:\_JSP\firstjsp\view folder. 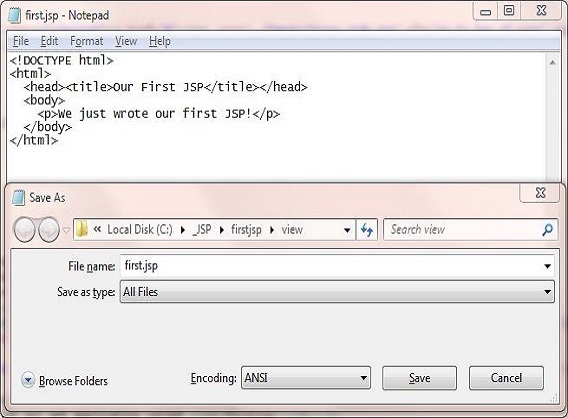 In the File name: text area type first.jsp and then click the Save button and close the Notepad. Change the Save as type: option to All Files as we don't want to end up with a .txt extension and then click the Save button and close the Notepad. 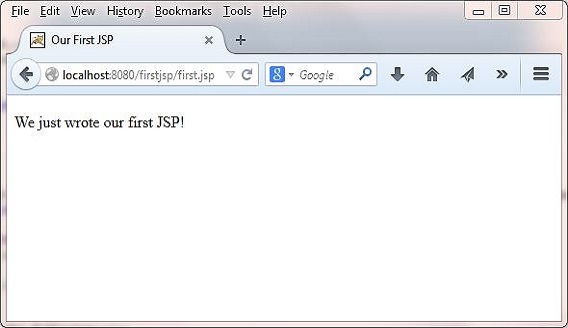 Copy the first.jsp file from our development environment into the firstjsp folder. 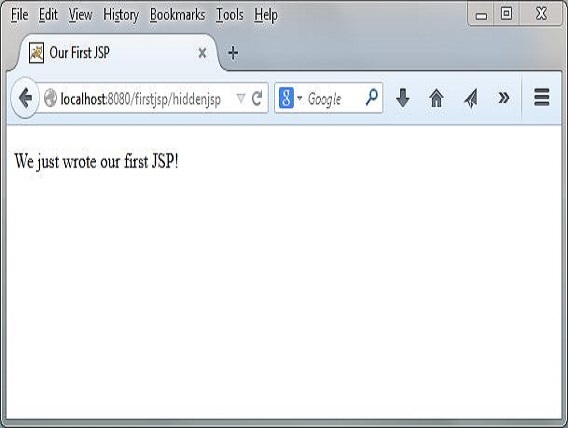 Create an empty WEB-INF folder within the firstjsp folder. As you can see this is a lot easier than coding a Servlet to see the same page in a web browser. We will go into the mechanics of how this is achieved by the container over the next few lessons. There may be occasions when we don't want a JSP to be directly accessed via a URL and in these cases the mechanics are very similar to what we do with Servlets. In these cases we would need to create a DD and place the JSP within the WEB-INF folder so it is hidden from direct access. 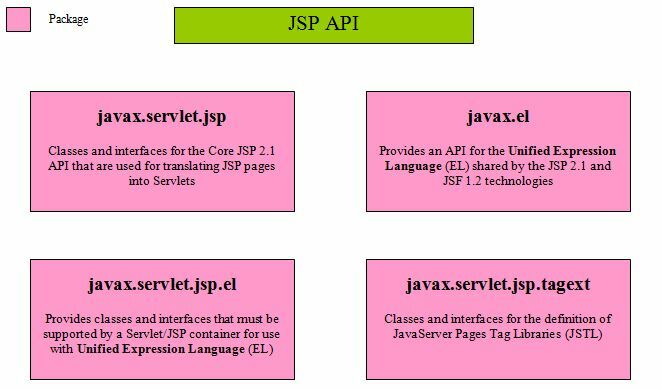 To access the JSP we use the top-level <servlet> element and use the <jsp-file> sub-level element instead of the <servlet-class> sub-level element. The DD below shows how we could access a hidden JSP. The <jsp-file> sub-level element defines a JSP file rather than a servlet to be invoked and is used for JSP files whose URL we want to keep hidden from users. The only difference here is that we need to use the fully qualified path from the application root to access the JSP, the rest of the mechanics are the same as when using Servlets. Copy and save the web.xml file above into the WEB-INF folder. It's the same JSP but now it's hidden from users unless they know how to get to it. In our first lesson on JSP 2.1 we talked about the advantages of using JSPs for our View and wrote a very simple JSP page and then used the same JSP but hidden in the WEB-INF folder. In the next lesson we make a much deeper inspection of JSPs by looking at the JSP lifecycle.